Safety and security is often a major priority for most people, but its often not at the top of their list. Outdoor emergency lighting is just the thing you'll need for any emergencies that arise, making you feel better about your safety. Most people never put any thought into planning emergency lighting because they think that tragedy will never strike. Until it does. Often you'll find that emergency lighting is required for commercial buildings and public spaces. Thats obviously because of the number of people a tragedy would affect in the event of an emergency. At first thought you might not think anything of it, but often emergency lighting serves two very important purposes. First as we've seen, its a form of emergency lighting to assist in the event of a tragedy. Second, its a form of outdoor security lighting important to maintaining the day to day safety of the people using the outdoor space. Outdoor emergency lighting is used in many commercial buildings including hospitals as a backup in case of a power outage. Since these buildings are equip with their own generators, conserving every bit of energy for the important task of saving lives is most important. Therefore these emergency lights must be energy efficient so that the majority of the energy used will be to operate important hospital computers and equipment. Outdoor emergency lights assist in helping keep people safe. Making it possible for people to see their way into and around the building's premises during an emergency is a top priority. When disaster strikes you have no choice but to make due with whats available. A triage unit can immediately turn an outdoor space into a mobile hospital. In these cases, emergency outdoor lighting is critical to sustaining the triage operations. 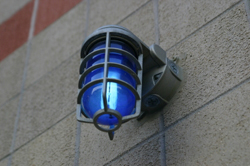 These emergency outdoor light fixtures must be energy efficient and portable. Industrial work sites often require emergency lighting in the event that something goes wrong. Oil refineries, nuclear power facilities, and hazardous chemical plants are all high risk industries for wide spread contamination and must be ready for any catastrophe. Although these job sites are equip with industrial outdoor lighting, emergency outdoor lighting is critical to maintaing the safety necessary when those industrial lights fail. Emergency lighting provides the backup light necessary to help emergency workers contain the contamination quickly. Having the proper safety procedures in place combined with the right emergency outdoor lights is important to keeping everyone safe in times of uncertainty. It may be hard to see why you would ever need emergency lighting for an outdoor retail space. But its probably not a bad idea to have emergency lighting in a retail space where many people come to shop. Remember earlier we said that emergency lighting serves two purposes. First, to assist in the event of a calamity and second as a form of outdoor security lighting. Because you can use emergency lighting as a form of outdoor security lighting, it makes sense to have them in a retail space. If security lighting is already present, it'll be easier to link up an emergency backup generator. So why you ask should I bother with emergency lighting if I don't own any commercial properties? Thats a good question. I will say that outdoor emergency lighting can provide you with a level of convenience, piece of mind, and safety you'll need whenever you have another blackout. Link it to your home security system and use your emergency lights for security lighting. Doing this will give you piece of mind knowing that these lights are designed with your safety and security in mind. They should be positioned in such a way that will give you, the homeowner viewable access to your surroundings instantly through a well thought-out layout. This will empower you with the element of surprise if you ever get a visit from some unwanted guests. Because emergency outdoor lighting can have multiple uses in the home, you'll have a way to keep your home secure and family safe at all times.